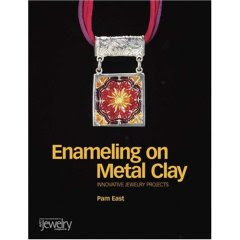 My friend Pam East has written a new book on combining two great media into stunning jewelry pieces! I have to be honest here and tell you that I don’t work much with either medium, so I’m not really in a position to tell you whether or not this is a good book. But from the reviews that Pam has received, I’d have to say that people who do know what they’re talking about agree: Pam’s book is a good ‘un! So if you’re looking for the next step in jewelry making, this might just be it. Enameling adds a whole new dimension to metal-clay jewelry. The striking, exciting projects in this book range in skill level from beginner to advanced and include earrings, pendants, pins, beads, and a ring. A tools and materials section, as well as metal clay and enameling basics, introduces key supplies and techniques. Easy-to-follow step-by-step directions are illustrated with detailed photos, and tips, tricks, and troubleshooting help ensure success. Some projects can be completed without a torch or kiln, making them even easier and more rewarding for those just starting out with jewelry-making.